When you start to buy makeup, you can go from one pallet and some mascara to 50 single shadows, 10 oversized pallets, 25 lipsticks and who knows how many eyeliners in what seems like a blink of an eye. This is fine because you need 5 different shades of brown shadows because one is cool tone and the other is a shimmer so you very well can't get rid of any of them. The problem is, all your makeup is slowly starting to eat your vanity and your desk because you have nowhere to put all these different sized and sometimes awkwardly shaped products except in that drawer that won't close anymore. That's when you realize you need a handy-dandy makeup organizer. But which one, and how big, and what should it look like? Well, we're here to assist you so you can stop stepping on lip liners when you're getting dressed. 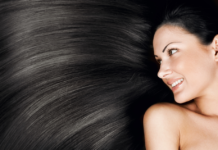 The products listed below were reviewed based on the following criteria; price, quality, availability, and features. 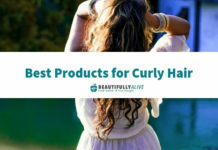 In order for us to provide you with the best options possible we must review each product to a set standard so we can insure that all of the items on our list meet a baseline so no matter which product our readers are researching they will always be getting a product that meets the requirements to be the best. Makeup pallets can take up so much space and it can be hard to find a place that can accommodate their unique shapes. With this organizer you can stack at least 8 pallets on its shelves or if you have a few more just remove the dividers and slide the extra pallets into place. 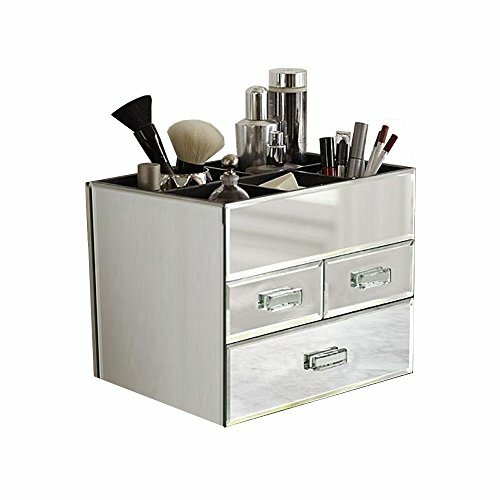 Add some cabinet space to your bathroom or vanity and make your life a bit easier with this acrylic storage case. It will help you organize all your favorite makeup items in one place. 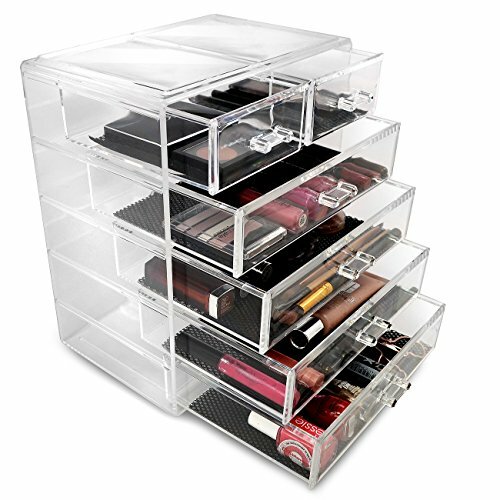 This sturdy, clear acrylic organizer includes 4 drawers that can fit different makeup items of varying sizes. It also has removable black mesh padding in the bottom of each drawer so that your makeup is protected and won't roll all over the place. The clear acrylic provides convenience and functionality by allowing you to easily find whatever you need while also stylishly blending in with the surrounding decor. Have you ever put your favorite lipstick on your clothes drawers so you could find it later only never to find it again? If you had this organizer, you could have avoided that tragic fate. 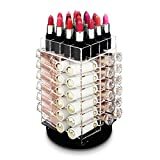 Unlike the other organizers on this list, this one is specifically for lipstick, and it rotates! 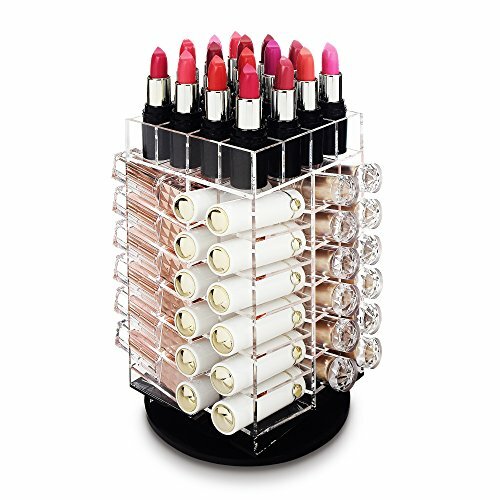 It has 52 slots to hold your favorite lip paints, and they are slanted so the lipsticks won't fall out. And the top compartment has a removable divider just in case you want to store some slightly larger makeup products or jewelry there. This organizer is as functional as it is beautiful. It changes the traditional style of the makeup box, with a three-dimensional polygonal design on the face of the organizer to provide texture to the box and interest to the eye. It also has a diamond push and pull handle to make the whole organizer more attractive. Functionally it has 2 large drawers and 14 compartments designed to help you organize your makeup and have it in an accessible place. The multiple storage spaces and varying sizes of these storage spaces allows you to put any makeup you have in this beautiful organizer. 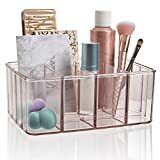 This organizer perfectly organizes your makeup in place, making it easy to store and find any type of makeup at any given time. It has three drawers designed with a special soft black velvet padding that helps to keep your makeup in place once you've organized it all. It is made of clear acrylic so you can see what is in each drawer before you open it. 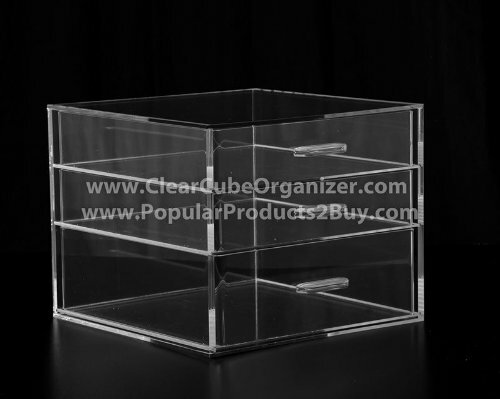 This organizer is made of clear acrylic. It is divided into 3 sections that can be swapped for customization purposes. The compartments in the organizer are of different sizes can hold almost any of your makeup necessities such as makeup brushes, foundation, eyeliner, mascara, lipstick, and nail polishes. The upper case has 10 slots, the middle case has 10 slots and the bottom stand has 4 large drawers. And it even comes with a 12-month warranty if the organizer becomes cracked or scratched. 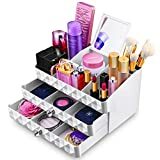 This makeup organizer set is great for storing your makeup brushes and sponges, cosmetics and even jewelry. 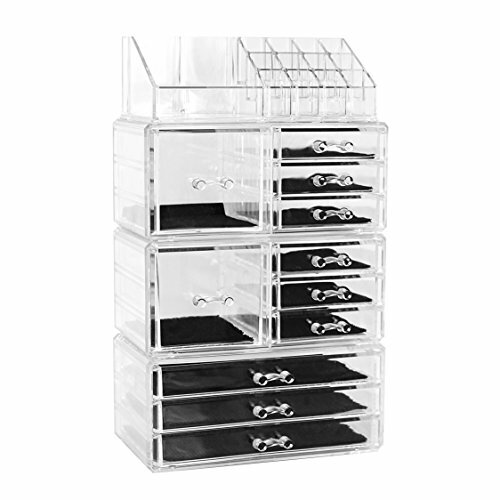 Its 4-piece design offers a lot of space for organizing and keeping all of your cosmetics and your other belongings in order. It's designed in a way that allows you to arrange all jewelry and cosmetics in an easily retrievable manner. It is clear so it will fit with any decor and it is well constructed. 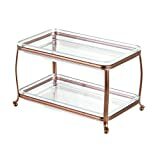 Unlike any of the other organizers on this list, this organizer is made of mirrored glass drawers that come in silver or rose gold. It has 3 pull out drawers that are lined with velvet for easy and safe storage of all your precious makeup items. 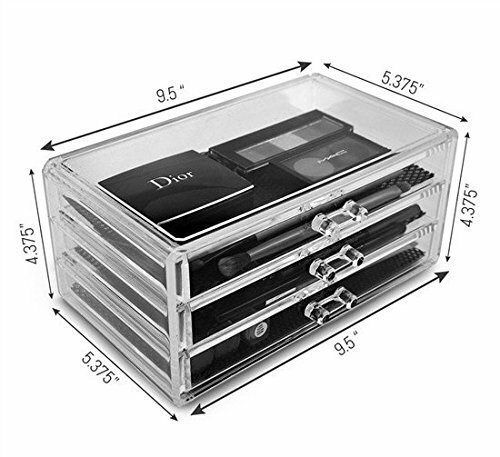 It also comes with a compartmentalized top to fit anything that may be too tall for the drawers such as makeup brushes and eyeliners. This makeup organizer helps you keep your daily makeup essentials in order and in one place. It also displays them in a way that keeps what you need easily visible. You can arrange them however you like with this organizer and its ample space. It has 3 large compartments and 2 small compartments that are ideal for holding palettes, makeup removers, and brushes. 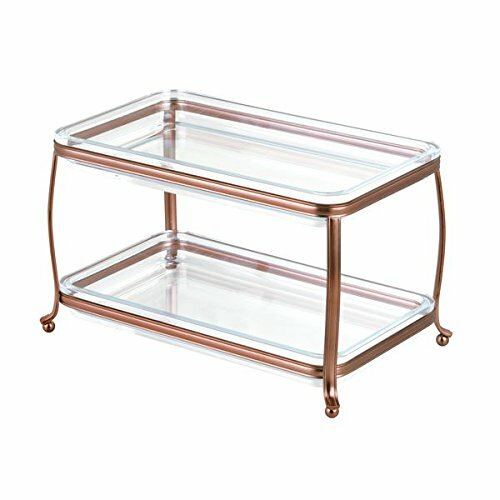 This rose gold, two-shelf tray organizer is great for storing all of your pretty products and displaying them for any houseguests to see. Its sleek and minimalistic design with the added pop of rose gold trimming is just enough to draw your eye to whatever cosmetics you may have on display. It has 2 shelves to place your products on for easy access and it's compact so it can fit right on your vanity or bathroom counter without causing a disturbance. The trays are easily removable which makes them easy to clean in case an unfortunate spill happens. 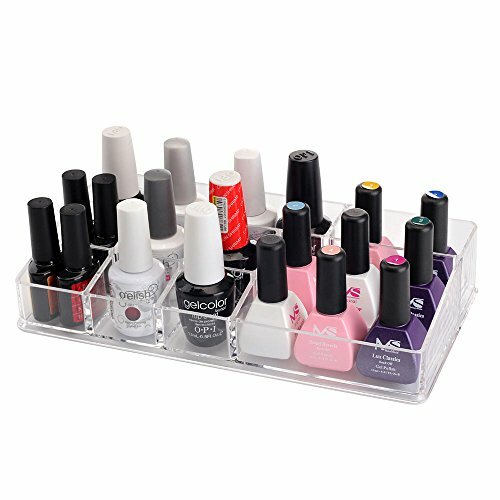 A makeup organizer is often an acrylic box that has drawers and compartments specially sized for makeup products such as lipstick, eyeliner and eyeshadows pallets. 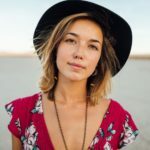 It keeps your makeup from ending up in places it shouldn't (like the kitchen, how that one coral lipstick ended up in the microwave, we'll never know) by having specific spaces for your makeup to call home. You decide which compartment or space best fits which makeup product and you store it there. These organizers can be found in a variety of places, but the ones below can be found online. 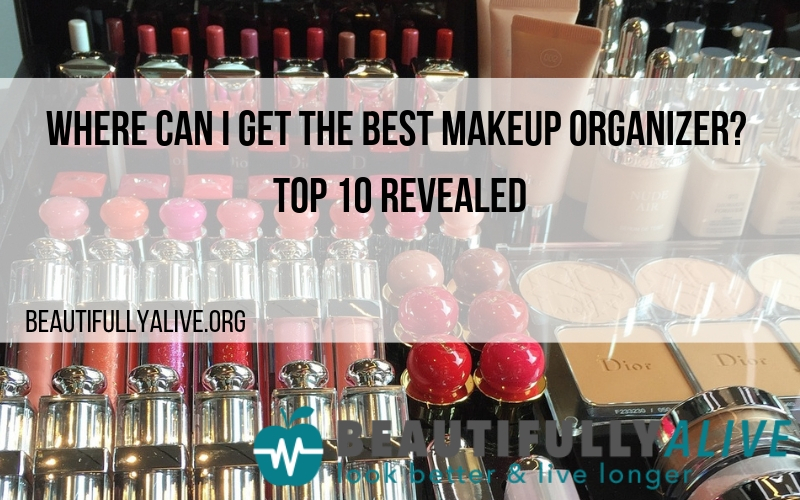 The makeup organizers we reviewed below range in price. 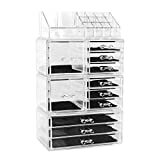 Although all of them will get the job done, however some of the more expensive organizers may have some more desirable features than some of the lower priced organizers. There are so many options for makeup storage. While this may give us a variety of options to choose from, it also makes it hard to choose which is the best. 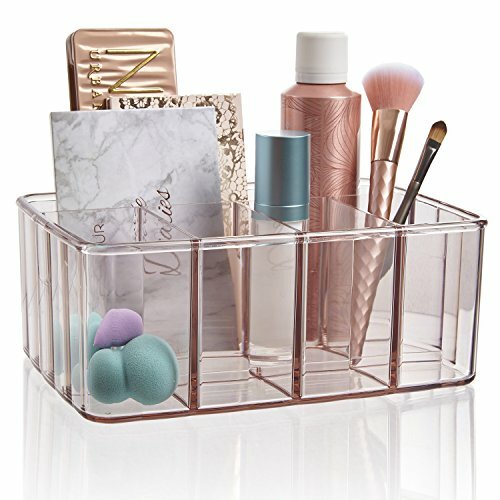 However, we have made a choice and the Unique Home 4 Piece Acrylic Makeup Organizer Set is the one. It has everything you could need to store any makeup collection. It also has perfectly sized slots for lipsticks, an area for makeup brushes, compartments for eyeshadows, blushes, and highlighters and drawers for palettes. It's an all in one, and it's very affordable so whether you have a few makeup pieces or if you have a lot of makeup it will be useful to you.